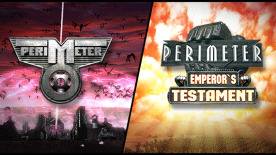 Perimeter is an innovative Real-Time-Strategy game that pits players against each other or AI opponents in a life and death struggle to seize territory and establish critical protective “perimeters”. In the near future a new Exodus begins, the remnants of human civilization have to leave the perishing Earth and start traveling into the Psychosphere. The ones who call themselves the Spirits - new pastors of the human race, believe that a new planet, suitable for living, will be found in the Psychosphere.